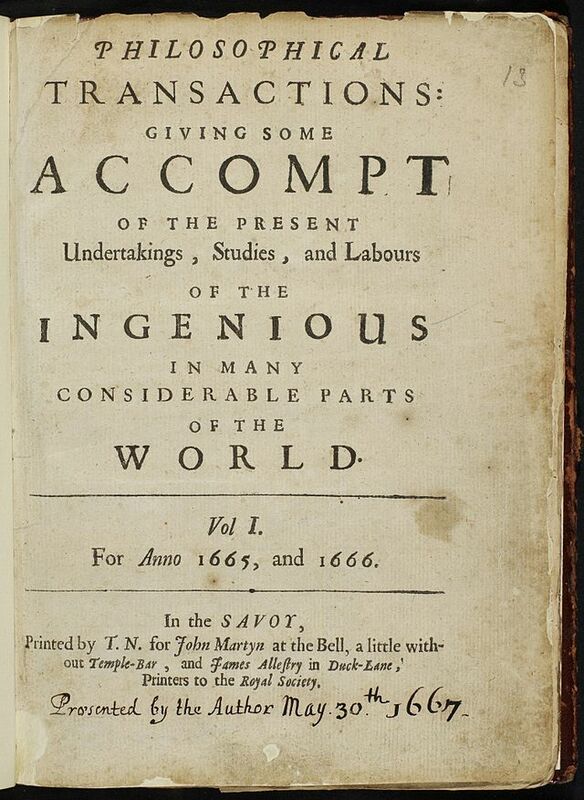 Today, 6 March 2015, marks the 350th anniversary of the launch of Philosophical Transactions [of the Royal Society], the world’s first scientific journal. To celebrate, the Royal Society has made all their journals free to access throughout March. Published under the visionary editorship of Henry Oldenburg (Secretary of the Royal Society), who privately funded its early years, the first volumes established the important principles of scientific priority and peer review. Namely, registration (to date stamp and add provenance), certification (although peer review wouldn’t be established formally until the mid-19th century), dissemination and archiving. In essence, the same central foundations of scientific journals today. The first article in the journal was on optics entitled ‘An Accompt of the Improvement of Optick Glasses’ Phil. Trans. (1665) 1 2-3. Over the centuries, many important scientific discoveries have been published in the Philosophical Transactions, including contributions by James Clerk Maxwell, Michael Faraday, Edmond Halley, Charles Darwin and, in 1672, Isaac Newton’s very first paper ‘New Theory about Light and Colours’. To put into perspective how journal publishing has grown over the centuries, IOP Publishing alone, publisher of the JPhys+ blog, publishes more than 70 journals with over 30,000 articles in 2014 and 22 million downloads. Could Henry Oldenburg have envisioned the concept of downloading? Our very own Journal of Physics series is now in its 47th year! Image: The first issue of Philosophical Transactions. Credit: The Royal Society, reused under a CC-BY 4.0 license.